ST. GEORGE — Tanner is registered under number 163382, a number the little boy hopes will get called one day. What that number doesn’t reveal is that he is a bright, 10-year-old fifth grader who does well in school, placed second in cross-country, loves to ride horses and that he’s a “country boy at heart.” Tanner is also waiting for a family to find him and to give him a home. Many children across the United States are born into a home where they are cared for by parents who provide stability and protection; but sadly, that’s not the case for 2,900 children currently in foster care in Utah, and the numbers continue to rise. Utah Foster Care is hosting a “Lunch and Learn” event Wednesday from noon to 1 p.m. at its offices located at 491 E. Riverside Drive in St. George. Lunch will be provided along with a presentation focusing on seeing children through foster care into adoption. Information and support will be offered to those who are interested in becoming a foster parent. Ashcraft said that the number of foster homes that are registered currently doesn’t reflect an accurate picture of the issue, primarily because not all of those homes are accepting new placements; others aren’t accepting placements at this time. This can result from a change in the family, a move or relocation, pregnancy or other change that prevents a family from accepting children for a certain period of time. There are also families that only want to adopt a child without providing foster care or temporary placement. Ashcraft added that placements are more suitable when there are enough foster homes available for children coming into the system because they can match the child to the family and vice versa. Without that, they are left to shelter the children temporarily and wait until a more suitable placement opens up. It is then left to the state to place the children in a home where they will be cared for, which is becoming more difficult because the number of children entering foster care is increasing at a higher rate than the number of homes available. Further, it is difficult to get definitive numbers because they are constantly fluctuating as new children are coming into the system or added to the adoption list while placement or matches for other children are found. There are approximately 150 children in Utah who are legally up for adoption who have yet to be matched to an adoptive family, with more than 12 of these kids located in the southwest region of the state. They are listed on Utah’s Adoption Connection and can be found in the “Heart Gallery” where Tanner’s adoption profile is listed. More than 600 children were adopted out of foster care in 2016. In partnership with the Adoption Exchange, Utah’s Adoption Connection provides the link between children waiting for adoption and families wanting to adopt. It also recruits families for children who have survived abuse and neglect and provides training, information and follow-up support. The luncheon is open to anyone interested in learning more about foster and adoptive parenting. “Come learn more about the program by meeting other foster/adoptive families and hearing about their stories and experiences,” Ashcraft said. 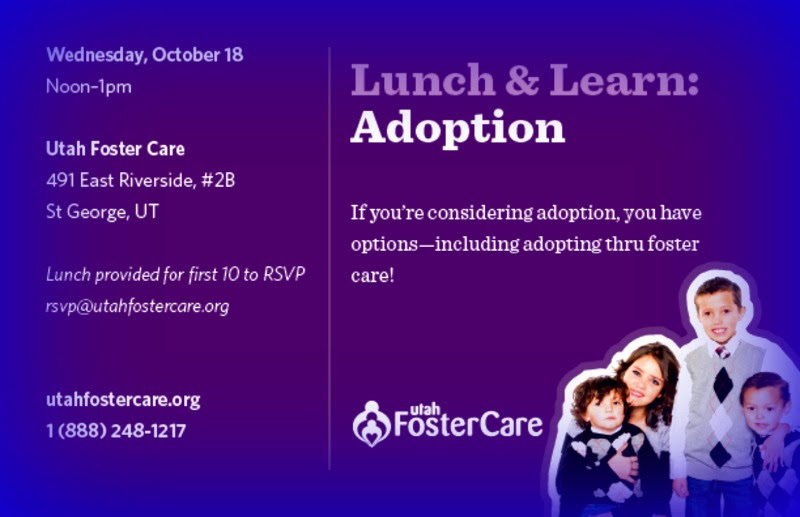 What: Utah Foster Care Lunch and Learn event. When: Wednesday, Oct. 18, from noon to 1 p.m.
Wednesday’s luncheon is the forerunner to Utah Foster Care’s annual “Adoption Celebration Event” being held for “everyone whose lives have been touched by adoption.” The celebration, aptly timed during National Adoption Month, will take place Nov. 18 at Staheli Family Farm, 3400 S. Washington Fields Rd., Washington. To find out more information contact Utah Foster Care at 435-216-3294 or by visiting the website at utahfostercare.org. Ed. Note: Updated with additional information on placement details.